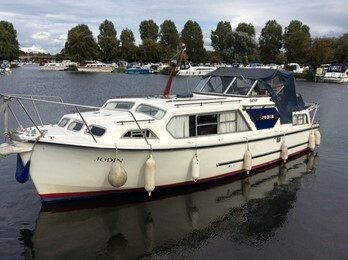 This version of the Ocean 30 had a rear cabin across the whole width of the boat which provided either 2 single berths or a fixed double berth. The fore cabin of the boat is the same as the standard model. As a result of the extra rear cabin moulding the cockpit is a lot smaller although when the canopy is down seating is available over the rear cabin. These craft were generally custom built for private use and a number of these models are on the River Gt. Ouse.